You can pre-determine a datas format depending on the data by formatting the field. If you are unsure as to what a field of data is, then click here to find out more. 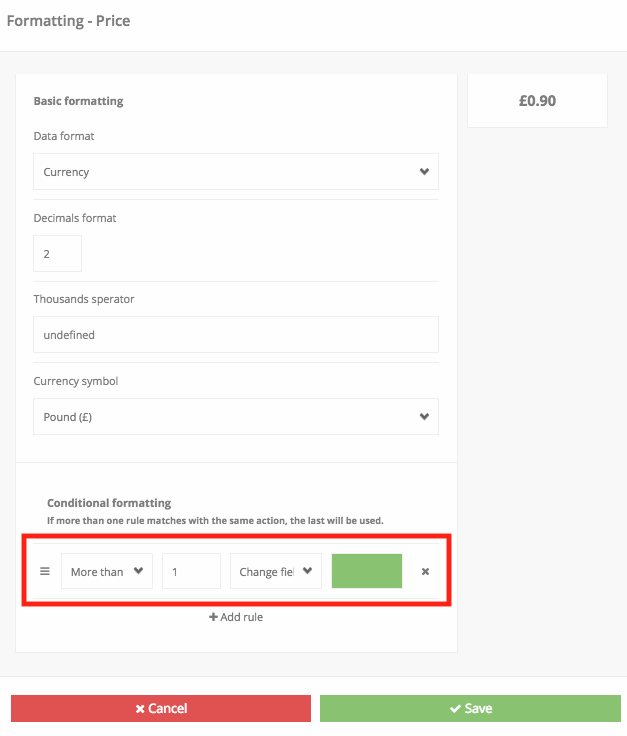 Once you have chosen and selected a field to show, you can then customise the formatting settings. This allows you to change its basic formatting as well the ability to add rules that pre-determine the formatting when data meets those rules. 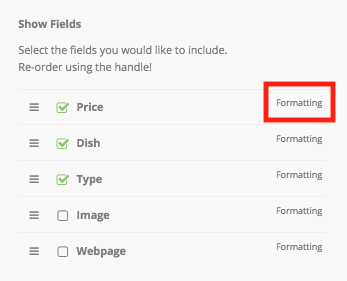 To edit the formatting of a field, simply click the 'Formatting' button to the right of the field name. The basic formatting option will set the format of the selected fields data. 'Text' - Formats the data to be shown exactly how it is written in the source. Conditional formatting is where you can set rules that will pre-determine the formatting settings of the data that meets these rules. As seen on the conditional formatting area, 'If more than one rule matches with the same action, the last will be used'. 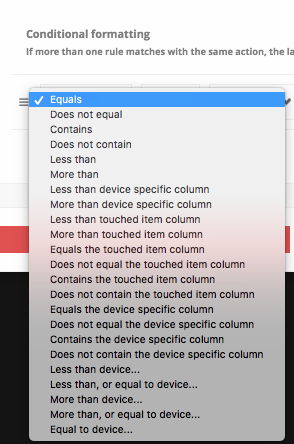 Select a query from the drop down menu. This will be the query that the rule uses to check against the field you are formatting. The next input box is where you enter the specified value. If you would like to find out more regarding these queries, click here. Select the formatting option you wish to edit if the rule is matched. The next input box is where you specify which text, colour the data changes to or set the settings for the media. 'Show text' - If the rule is matched, change the text to the value specified in the next input area. 'Show media' - If the rule is matched, show the media item selected. 'Change row text colour' - If the rule is matched, change the entire rows text colour to the colour selected in the next input area. 'Change field text colour' - If the rule is matched, change the fields text colour to the colour selected in the next input area. 'Change row background colour' - If the rule is matched, change the entire rows background colour to the colour selected in the next input area. 'Change field background colour' - If the rule is matched, change the fields background colour to the colour selected in the next input area. 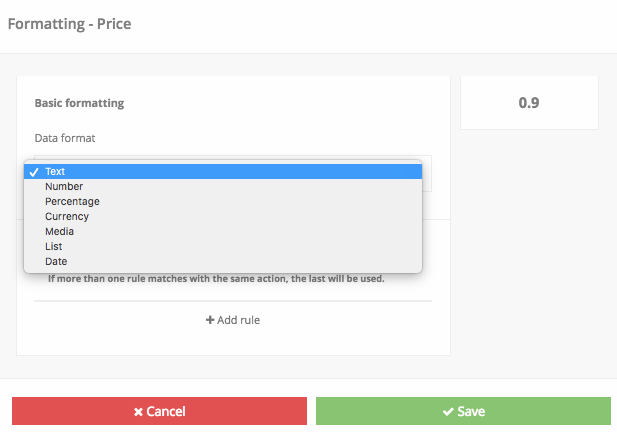 In our example below, we are going to change the text colour of all of the 'Price' fields to green if the price is over £1.00 (1). 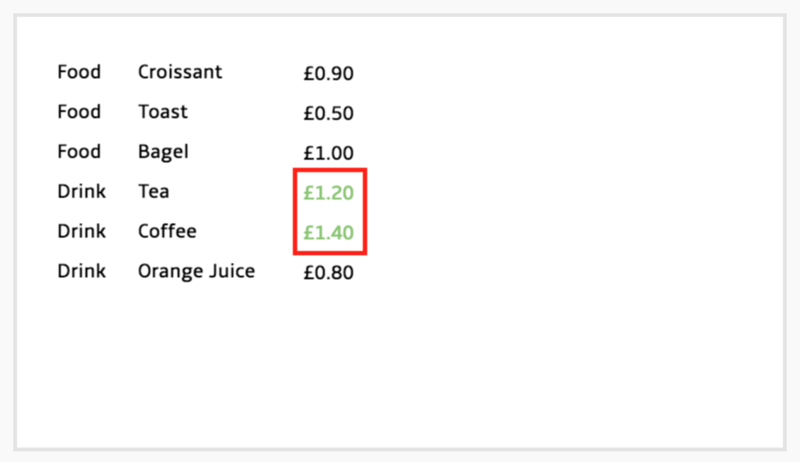 As you can see, when we preview our layout, the two prices about £1.00 now have a green text colour.